In the wake of February’s BC Budget, property taxes have been making headlines. But less attention has been paid to the province’s unusually low property tax rates, particularly in Vancouver, and how they help fuel the housing crisis. The annual residential property tax rate paid in Vancouver—including municipal, regional and provincial portions—is a quarter of one percent (0.26%) of assessed value. That’s less than half of the rate in Toronto and the eight other major Canadian cities compared in a recent report by Altus Group.2 Rates in Vancouver’s suburbs are also lower than any of the comparators. In concrete terms, property taxes on a $1 million property in Toronto were approximately $4,673 in 2017, while in Vancouver they were $2,555.3 After you factor in BC’s generous Home Owner Grant, the bill in Vancouver falls to $1985. The story is similar for a $4 million property, which in BC would now be subject to a surtax on the provincial portion of property tax (also known as the “School Tax”). The change announced in February’s BC Budget adds a 0.2% surtax on the value between $3 million and $4 million, and 0.4% on value above $4 million, building progressivity into the property tax system in a way that the CCPA has long recommended. In Vancouver, property taxes on a $4 million property were about $10,220 in 2017, and with the surtax this would rise to $12,220. The taxes on a $4 million property in Toronto are much higher at $18,693. Even after incorporating BC’s new surtax on high-end properties, taxes on a $4 million property are still more than 50% higher in Toronto than Vancouver. 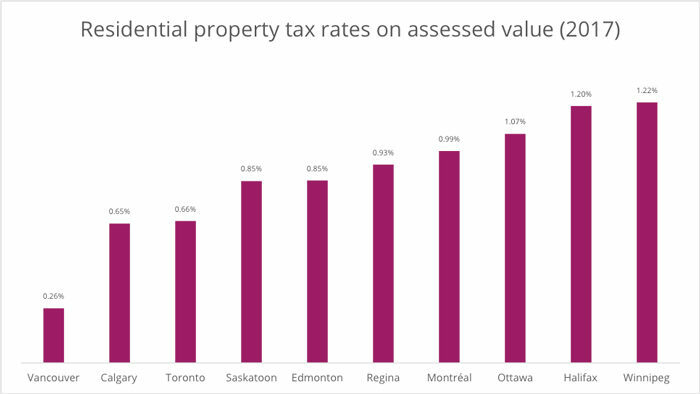 Some will insist that taxes on properties should be compared not based on actual property values, but using different values across cities, since typical values are so much higher in places like Vancouver. I discuss this below and explain that Vancouver has very low property taxes by this measure, too. But the straightforward tax rate is important in itself and often overlooked. One little-discussed effect of having low property tax rates is that it encourages holding residential real estate as an investment. Most investments have a “carrying cost,” and low taxes mean the carrying cost for property investment in Vancouver is very low. This makes investing in property attractive compared to holding other types of assets. Vancouver’s property tax rate is so low in part because of a quirk of how property taxes are levied. Rather than locking in a tax rate (or set of rates) as we do with income tax or sales tax, property tax rates change every year. A municipality determines its annual budget, and then property tax rates are set for the year at a level that will raise precisely this amount of money. This steadily decreases the carrying costs of property, making Vancouver property an ever more attractive investment. By increasing demand, this puts upward pressure on prices, which leads to further declines in the tax rate, and so on. In other words, as the tax base of property wealth grows, property tax rates are paradoxically decreased, meaning a continually smaller proportion of that wealth is taxed. This also means a smaller proportion of property wealth is harnessed for the public good (even though public investments like transit, schools, parks and basic infrastructure give urban land much of its value). Some argue that property taxes should be compared using “typical” properties in each city (even if they are of very different value), rather than comparing properties of the same value. This approach is also informative, but it ignores the huge growth of property wealth in cities like Vancouver and overlooks the incentives created by low carrying costs to hold real estate as an investment. Even by this measure, though, Vancouver’s property taxes are low. In a recent Vancouver Sun op-ed, Elizabeth Murphy claimed—incorrectly—that Vancouver has the highest property taxes in the country by this measure. But the chart she published suffers from a glaring methodological flaw. Instead of using the overall benchmark price for properties in each city, her chart uses the benchmark for only the most expensive sub-segment of the market: single-family properties. When the overall benchmark is used, typical property tax bills for Vancouver are among the lowest of the cities compared.9 After subtracting the Home Owner Grant, Vancouver has the lowest of the group at $2,155, which is more than $1,200 lower than Toronto. As a thought experiment, imagine instead of continuing with perpetual rate decreases, Vancouver’s residential property tax rate were frozen at the 2015 level of 0.35% (or even the 2000 level of 0.63%, which would still be lower than Toronto today). The result would be a mix of additional revenue and lower property prices, since the increased carrying costs would make real estate a less attractive investment, decreasing demand. These are both desirable outcomes,10 and would ensure a larger share of the “land wealth rush” is captured for the public good, something that hasn’t happened to-date in Vancouver. With additional revenue, the city or province could budget for the creation of hundreds or even thousands of new social and co-op housing units each year. As affordable units open up, this would also put downward pressure on prices of other units in the broader market. Property tax rates should be structured progressively so that those at the highest end of the market pay the highest rate, as the CCPA has recommended. The additional provincial School Tax on properties over $3 million is an important step in this direction. But the BC government should also allow cities to use progressive rate structures, as the City of Vancouver has already requested. Vancouver still has very low property taxes, and it’s time we faced up to the reality that they are helping to fuel our housing crisis. BC as a whole also has low property taxes, as recent tax competitiveness expert panels have noted (along with the Ministry of Finance’s interprovincial tax comparison tables—see Budget 2018 Table A3). Rates adapted from Altus Group, 2017. 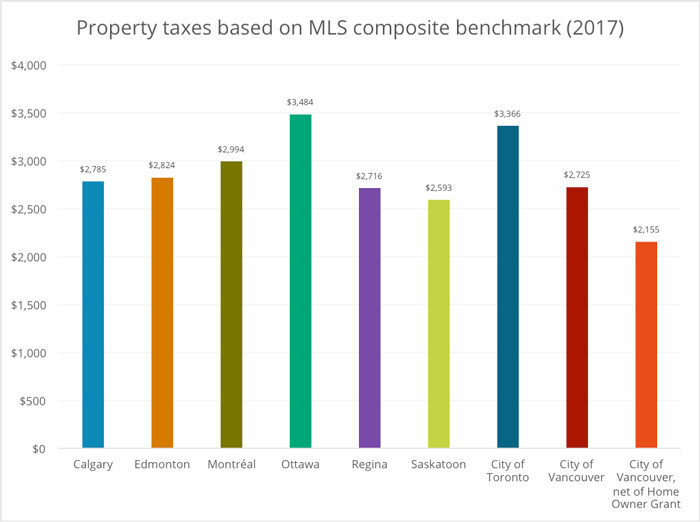 Canadian Property Tax Benchmark Report. Note that effective rates on market value would be somewhat lower than shown here for Toronto and Ottawa due to Ontario’s system of averaging increases to assessed values over four years, and for Montreal due to assessments currently being frozen at the 2016 level. I adjust for these factors in the estimates of property tax bills given later in the article. The effective rate for Vancouver would also be lower after subtracting BC’s Home Owner Grant, which applies to at least 91% of principal residences in the province. Applying Toronto’s property tax rate of 0.662% to an assessment value of $1 million would actually yield even higher total property taxes: $6,620. I’ve adjusted the Toronto property tax bills downward to reflect Ontario’s system of averaging property assessment increases over four years. Toronto taxes as shown have been adjusted downwards to account for Ontario’s system of averaging property assessment increases over four years. The MLS Home Price Index is used to estimate average increases and make the adjustment. Taxes are based on 2017 rates. Includes additional surtax on property value over $3 million. Taxes are based on 2017 rates. The effective rate is even lower for principal residences under $1.76 million after accounting for the tax reduction provided by the Home Owner Grant. Owning property provides other major financial benefits in the form of either a place to live (the market value of which is called “imputed rent”) or a stream of income from renting the property to a tenant. There are also other carrying costs such as maintaining the property, but, on balance, I’m actually understating the financial returns to owning property by focusing solely on increases in the asset value. In addition, gains from the increased value of principal residences are exempt from capital gains tax. The mill rate for the provincial portion of property taxes—the School Tax—in BC is adjusted downward in a similar way as property values rise. Based on the January 2017 MLS composite benchmark price for each city. Data from the Real Estate Board of Greater Vancouver, Toronto Real Estate Board, and Canadian Real Estate Board. For the City of Vancouver, where the benchmarks are separated between Vancouver East and Vancouver West, a simple average of these two benchmarks is used. This follows the practice used by Professor Andrey Pavlov who is cited by Murphy (Pavlov, personal communication). Adjustments are made to reflect property assessment averaging and freezes in Toronto, Ottawa and Montréal, as described in an earlier endnote. Note that the Montreal MLS benchmark is for Greater Montreal rather than the City of Montreal, due to data availability (also following Pavlov). This doesn’t necessarily mean that prices would have fallen in absolute terms. It could mean that increases are simply slower than they would have been in the absence of the tax rate freeze. A version of this piece is published in the Vancouver Sun.